After working most of the Summer with my 4 year old daughter yesterday she rode the wave for a while without the rope! So proud! A little more work and she will be working that wave! Very cool! I bet if she learns to balance her weight so she doesn't turn heelside, she can ride forever. She was still getting a push back where most adults lose it. That is awesome. I got my daughter out on the surfboard with me once last year when she was 4, but I haven't been able to talk her into it again. That's awesome. It makes me wish I had my boat when my son was that age. I did get my son out on the surf board back when he was four though. It was awesome! 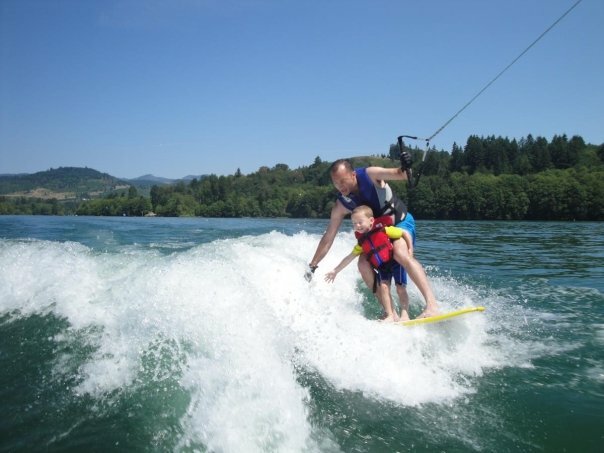 He's 7 now and I look forward to getting him out and maybe even surfing on his own like your daughter! That's one if the coolest things I've ever seen!